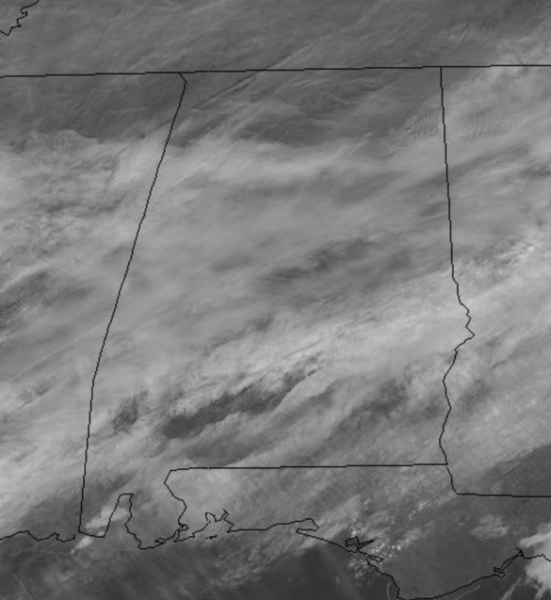 Clouds continue to linger across Alabama today and for the most part we are not expecting to see much in the way of the sun this afternoon. Any precipitation that was falling from the sky earlier has ended or pushed over into Georgia. It remains a rather chilly day with current temperatures in the mid 40s. This afternoon, temperatures should top out in the upper 40s to lower 50s across the area. TONIGHT: The clouds stick around and that should keep out temperatures around 40 degrees in most locations by first thing tomorrow morning. There will be the threat of a few scattered showers over eastern and northern portions of the area, but most locations will be staying dry. SHOWERS FOR SUNDAY: Tomorrow will be another day where clouds will dominate the Alabama sky. Temperatures will once again be rather chilly with upper 40s in the east to lower 50s for central and western portions of the area. Rain chances will be increasing as well so some scattered showers are expected through out the day, so plan accordingly. THE WEEK AHEAD: Monday will be mostly cloudy and warmer with scattered showers and temperatures will rise into the 60s. Then, rain is likely on Tuesday with a cold front approaching. There could be a few storms Tuesday, but no severe storms are expected at this time with very little surface based instability. 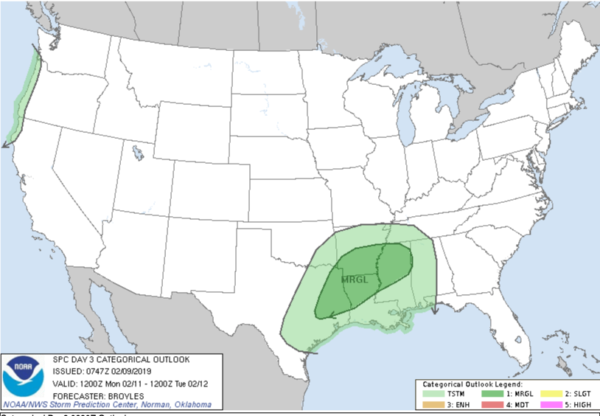 We do note the SPC has areas just to the west of Alabama highlighted in “Marginal Risk” for severe storms on Tuesday, but once again, no part of Alabama is currently included in this risk area. We will be watching things in the coming days as this could change. The front clears the area Tuesday night and Wednesday will be dry with a good supply of sunshine along with a high around 60. Clouds increase Thursday, and we will have periods of rain Thursday, Thursday night, and Friday.